Co. Carlow: Bagenalstown (2), Barragh (2), Borris (2), Carlow (4), Fennagh and Nurney (2), Grangeford, Idrone West (3), Kellistown, Kiltennell (2), Myshall (2), Tullow (2). Queen's County: Arless (2), Graigue (3), Shrule (2). Later additions: Agha, Ardough, Ballickmoyler, Ballinacarrig, Ballintemple, Ballon, Ballyellin, Ballylehane, Ballymoon, Burtonhall, Clogrenan, Clonegal, Corries, Cranemore, Doonane, Farnans, Garryhill, Johnstown, Kilbride, Killedmond, Killerigg, Leighlinbridge, Newtown, Nurney, Old Leighlin, Rathanne, Rathornan, Rathrush, Ridge, Rossmore, Shangarry, Sliguff, Tankardstown, Templepeter, Tullowbeg, Turra. 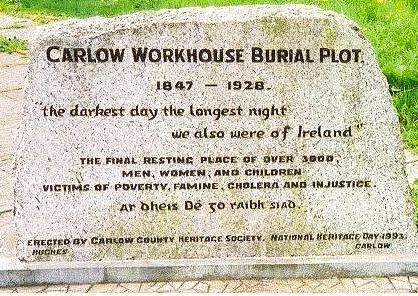 The new Carlow Union workhouse was erected in 1842-4 on a 7.5-acre site ¾ of a mile to the south of Carlow. Designed by the Poor Law Commissioners' architect George Wilkinson, the building was designed to accommodate 800 inmates. Its construction cost £9,000 plus £1,470 for fittings etc. The site location and layout are shown on the 1908 OS map below. 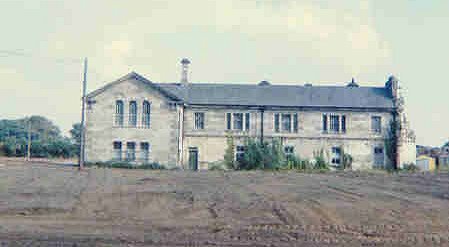 The workhouse was declared fit for the reception of paupers on 16th September 1844, and received its first admissions on 18th November. Wilkinson's proposed design for the workhouse is shown below. Male accommodation lay at the north of the site and female to at the south. Single storey probationary wards lay to each side of the entrance at the west. the three-storey central portion of the main building probably contained administrative offices, the Master's quarters and Guardians' board room. The wings to each side contained inmates accommodation with children's quarters and school rooms at each end. Kitchens and washhouse lay to the rear, leading to a central spine containing the chapel and dining-hall. Infirmary and idiot wards stood at the east, each with its own yard. 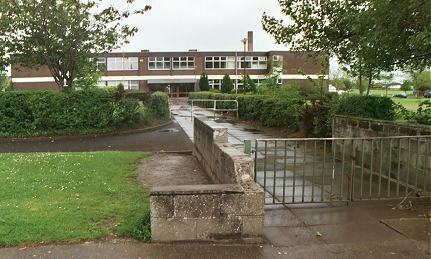 Carlow northern school wing from the west. A mortuary lay at the rear, with the workhouse's burial ground at the south-east of the site. The map also shows a small lodge stood at the entrance to the site at the west. Although Wilkinson's design had many elements in common with his other Irish workhouses, the long main block with its swept-back arcaded wings was unique to Carlow and resulted from demands by the Guardians for a building that was in keeping with the style of others in the area. The arched walkways along the front of the building's wings does not appear on surviving photographs but they may have been removed at some point in the building's history. A similar feature can be seen at the St Asaph workhouse in north Wales. In 1921, the Free State Army commandeered the workhouse buildings, with the existing inmates being removed to the town's Old Barracks which the Army were vacating. The Barracks — a three-storey building with stables on the ground floor — were then fiited out as a County Home. 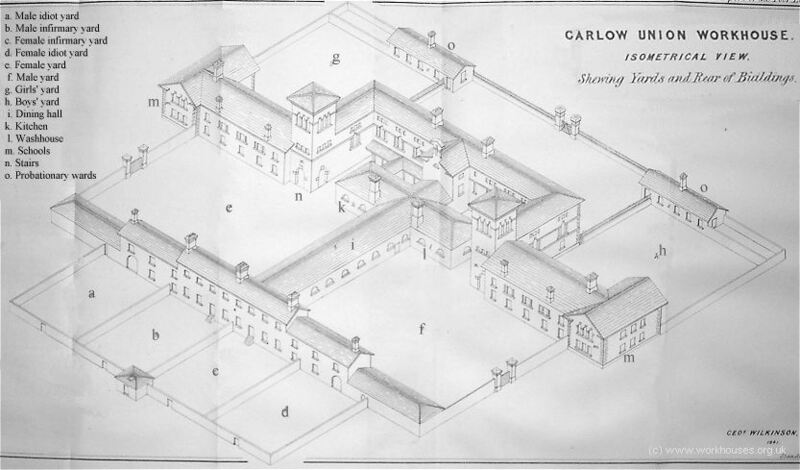 The Carlow workhouse buildings no longer exist and a college now stands on the site. Carlow County Library, Tullow Street, Carlow. Holdings: Guardians' minute books (1845-1923).